This book was provided to me via NetGalley by Joslyn Press for the purposes of reading and reviewing it. Even though it was provided at no cost, I am under no obligation to give the book a positive review. Since I finished this book, I’ve been stewing on what to write about, how to approach this review. I’m not sure where to start or what to say, and that’s a good thing. Let’s start with why I read this book. 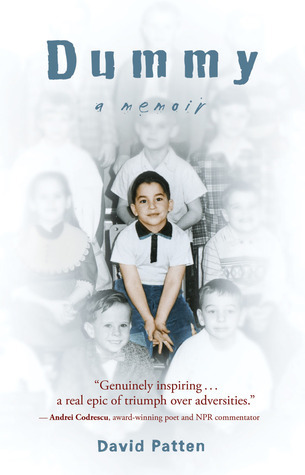 As the parent of a special needs adult, I was very interested in a memoir written by a special needs adult, hoping to get a sense of how they struggled, thrived and even failed. I also have friends and martial arts students in the autism spectrum, so I was hoping I would be able to get something out of it for their benefit. What I got from this book was so much more. First, let me question those reviewers who’ve bashed the book for being poorly written or not really telling much until the end about how he survived and what he learned. Let’s not forget the book was written by an adult who is unable to read and write beyond a very remedial level. This is not a well-written literary biographical tome. This is a memoir, and the easy language and tone is reflected throughout, as if David is simply telling us his story in his own words. As for the lessons, if you pay attention, you learn them as he progresses through his life. He doesn’t have to tell you explicitly; it’s right there in front of you. That said, I loved loved loved this book. I regret that I have but five stars to give for this book. David Patten was born with autism, likely Asperger’s Syndrome due to his high functioning ability, and dyslexia. Early in his infancy and into his childhood, sensory input and processing is very painful for him. His mother tries to prevent him from withdrawing into himself and tuning out the world by forcing him to engage and deal with everything around him, literally becoming his round-the-clock provider in the process. Along the way, David learns to disassociate the feelings and input from what’s going on around him. David’s older brother Emerson despises him for taking away his mother, as Emerson was left with a part-time caregiver to help him out. This leads to years of conflict where each of them tries to literally kill each other (Emerson by smothering, David with a screwdriver thrown at Emerson’s head). Not surprisingly, David struggles in school. Since he was born in 1954, the educational system at the time had no idea what to do with him. They knew very little of autism or learning disabilities, so they categorized him as slow, difficult, absent-minded, and all other labels. As he struggles in school, he drifts away from the mainstream students, eventually finding his way as a drug user. Later he finds success as a dealer, which serves as a source of both income and conflict for several years. Along the way, he finds Donna, strung out on speed and protecting a water fountain, the victim of a practical joke. As David always found himself protecting those who couldn’t protect themselves, he stands up for her, and thus begins an on-and-off relationship that lasts for years. They are symbiotically tied together, each needing the other in what were ultimately unhealthy ways, but they still held together. A suicide attempt gone wrong, using Valium and liquid mercury as the vehicle, eventually causes David’s mother to begin pushing him away. While loving her son, she can only handle so much pain and suffering. The sudden death of David’s father and the strain it puts on the family only serves to heighten the stress and pressures of day-to-day life for David, his remaining sibling at home, and his mother. Throw in some time in the group home of Jacqui Schiff, famous and infamous for her reparenting work, being responsible for the care of and authority over a bunch of schizophrenic residents. This goes bad in horrible ways, and once again, David is on the go, Donna at his side. And so goes the book, David and Donna on again, off again. David struggles with his own spirituality and existence throughout the book, always seeking understanding for who he is and why he’s in existence. Technological advances lead to a great career for David, even with his inability to read and write, but even those advances eventually become a double-edged sword. How does David survive day-to-day without being able to read and write? Does he maintain a career? Does he ever find love and happiness? Does he ever reconcile with his mom and older brother? I saw a review saying this book read more like a movie script. In many ways, it’s true. Just when you think the story will settle into a routine, here comes another plot twist. When you consider it’s all true, and not a fictional action-adventure flick, it’s all the more amazing. What I took most from this book was that over and over and over again, David simply did what he needed to do to survive. He learned to fight and protect himself. He learned to read the slightest alterations in body language, tone, etc., to know when someone was going to go over the edge. That combination even serves him well when some drug users try to throw him over the railing of a tenth story landing at school. David tries to find love and what it means, but ultimately ends up taking care of himself first. No matter what struggle he encounters, he finds a way to overcome it. Even the suicide attempt led to a better understanding of what it took to survive and how the attempt affected those around him. Bottom line is, this is a tremendous story about the human will to survive. Time and time again, David Patten is given every reason to give up, to disappear into the shadows and become another statistic. And yet time and again he finds a way to continue on. I strongly recommend this book for anyone who wants to read a powerful story of love and survival at all costs. You won’t regret it.